The moderation, and the veracity of Abu Bakr confirmed the new religion, and furnished an example for invitation. his conversation agreeable and his demeanor affable and much sought after by the Quraysh and he was popular throughout the city.... The faith of Abu Bakr was the greatest guarantee of Muhammad's sincerity in the beginning of his career, and indeed, in a modified sense, throughout his life. To have such a person as a staunch adherent of his claim, was for Muhammad a most important step. 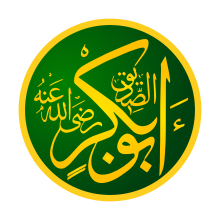 From 622 to 632 he (Abu Bakr) was Mohammed's chief adviser, but had no prominent public functions except that he conducted the pilgrimage to Mecca in 631, and led the public prayers in Medina during Mohammed's last illness. ↑ Islamic Culture by the Islamic Cultural Board Published 1927 s.n. Original from the University of Michigan, digitized 27 March 2006. ↑ Hazrat Abu Bakr, the First Caliph of Islam by Muhammad Habibur Rahman Khan Sherwani, published 1963 Sh. Muhammad Ashraf. Original from the University of Michigan. Digitized 14 November 2006. ↑ ক খ Tabari: Vol. 2, p. 554.